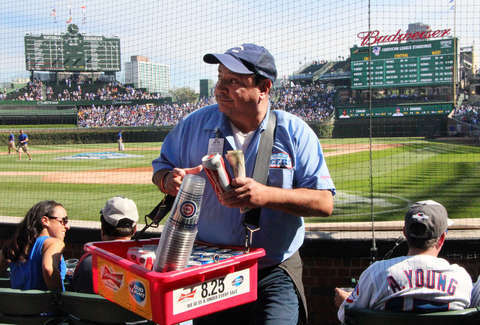 As the Cubs continue their charge to fulfill the playoff prophecy foretold in Back to the Future Part II, let us take a moment to recognize the off-field workhorses of Wrigley Field: the almighty beer vendors. 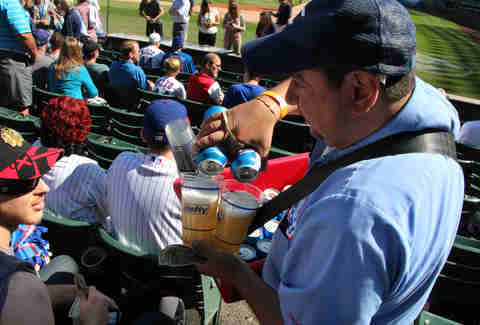 Selling beer at Wrigley is akin to serving as an ambassador to Chicago, it’s a coveted position and only those who can put in decades of dedication are cut out for it. 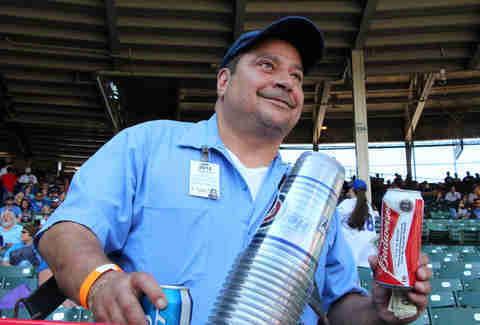 We shadowed affable all-star beer vendor Rocco Caputo, a 32-year veteran of the job -- who even earned a plaque after calling out Cubs chairman Todd Ricketts for dumping out hot dogs on Undercover Boss -- to get the lowdown on how to hawk beer inside the Friendly Confines. Seniority rules in the beer-vending game. Rocco started working at Wrigley when he was 16 years old and he's still got 40 guys ahead of him with more service time. The elder statesmen get assigned regular territories and first dibs on beer brand selection. At a sell-out game there will be up to 120 beer vendors working, if there's shorter attendance the rookies have to move down a peg to selling hot dogs or pop. Any vendor worth his salt knows just where his season ticket holders are in their section. Those fans can be loyal to the point of only buying from their one favorite vendor and they might even buy him a post-game beer over at The Full Shilling. Rocco certainly has a strong following, he can move a whole case of 24 tallboys in just one row if the regulars are at the game like in the 2003 playoffs (it was much needed). Day games are better than night games because you can sell through the eighth inning as opposed to just the seventh. A rivalry game will boost sales -- a Padres game in May, not so much. For weather, you don't want it too cold or hot outside and rain expectedly ruins everything. Vendors are aware if the starting pitcher is a fast worker, like when Mark Buehrle was on the mound for the White Sox, or more methodical. Pitching changes are a blessing. ... in maintaining the proper flow of booze (in baseball standings too, I guess). It's tricky, but an ideal situation is that the Cubs score a batch of runs early in the game, not so many that it's a blowout and fans leave but enough to keep everyone engaged and sticking around for that extra beer or two. 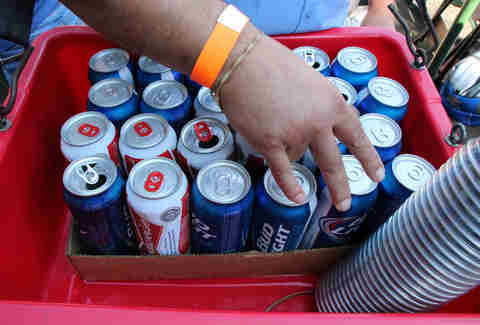 There's no DL for concessionaires, so while on the job you've got to avoid things like cutting your finger on the lip of a can as you nail the grip on a double pour or having your beer tub (a 25lb weight around your neck when full) blocking your view of children scurrying around the park. But nothing hurts more than the agony of dropping a full beer, which comes out of pocket. Maybe a stray line drive, maybe. Most Wrigley vendors will double down and work White Sox games too, although given the choice it's usually easier to move units at Cubs games. Rocco’s also sold beer at Blackhawks games -- where you have to kneel down in between whistles -- Bears games, and Jordan-era Bulls games. 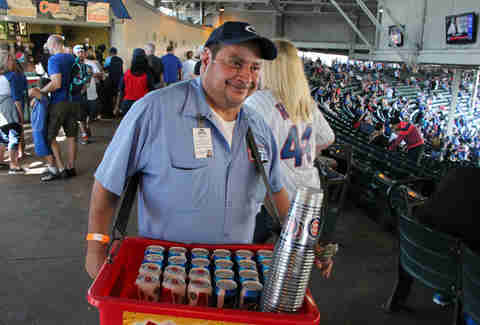 While stadium beer sales statistics are harder to find than a sensible explanation of VORP, there's some scratch math you can do to figure out a beer seller's salary or at least be... in the ballpark. If a vendor works every home game, and can move an average of 10 cases of beer per game (240 beers), on $.50 tips alone (there’s also a commission on each beer), they can draw a five-figure salary in a season. 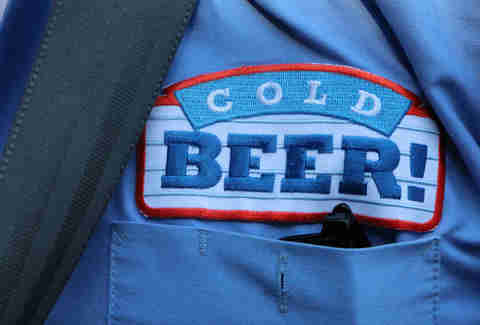 Thanks to the part-time flexibility, beer vending is a second job for most. Among the staff you'll find school teachers, constructions workers, etc. Rocco, himself, was even a mail carrier at one point. While most hawk with some variation of “cold beer here,” Mark Reiner works the area along third base and sings pop tunes with more beer-centric lyrics. If this doesn't impress your date at a ball game, you need to make a call to the bullpen. Sean Cooley is Thrillist's senior editor and he can no longer leg out home runs in softball. Follow him on Twitter: @SeanCooley.